Seahawks fan Tammy Duenas celebrates the NFC Football Championship win against San Francisco at Northern Quest Resort & Casino's EPIC bar. On Aug. 7, 1976, Spokane got NFL football. They'd seen it before — exhibition games played between teams from far-off places — but now the city was watching its own team. They were not the Spokane Seahawks, but for those who had ventured out to the fledgling team's training camp in Cheney that summer, they might as well have been. Todd Weaver was at that game at Joe Albi Stadium as the Seahawks, decked out in blue and gray, a sleek bird's head stretching across their helmets, took on the Chicago Bears. It was the day after his 11th birthday, and the Spokane native was now a Seahawks fan. Thousands of fans have been with the team since day one. "We used to go down to 7-Eleven to get Slurpees and they'd have football players on the cups. All of the sudden they had Seahawk players on them," says Weaver. Now, he had his own team, a team that he watched — along with 68,000 other fans, including several other Spokanites — win the NFC championship more than 37 years later. Weaver, a season ticket holder, is hardly the only Inland Northwest denizen to remain faithful to the Seahawks in the time between that game at Joe Albi and Sunday's Super Bowl. And while there are bound to be the sort of bandwagon fans in Spokane who deck themselves out in blue and green, yet think Doug Baldwin is the name of one of Alec's brothers, the Seahawks have their die-hards on this side of the mountains. That's no accident. If we were on the East Coast, 280 miles away from an NFL team's home stadium, we'd likely pass through a few other teams' territories on the way there. That's not the case here, where 280 miles is no problem for a morning's drive and there are no other professional teams within almost a thousand miles. If pro football was going to work in Seattle, the team's founders realized, they'd need to make this the Northwest's team. The Seattle Seahawks' very first days as a football team didn't take place in Seattle, but in Cheney. Players, having landed by expansion draft on a team with no history, traditions or proven fans, found themselves sleeping in cement-walled dormitories and practicing on a hot grass field in a town with just a few stoplights. You'd find players like Jim Zorn and Steve Raible at local bars and restaurants, and thousands of fans lined the practice field to get a look at the NFL's newest team. Local TV news and sportswriters were all over it, giving updates from nearly every day of camp. Pat McDonald was a Washington State University student in the early 1980s when he caught the Seahawks bug. Over the years, he'd make it up to Cheney to check out camp, returning with his kids as an adult. "The team realized that there is a true fan base out here when they saw the turnouts at the camps," says McDonald, who now serves as president of the Spokane Valley chapter of the Sea Hawkers, the team's official booster club. 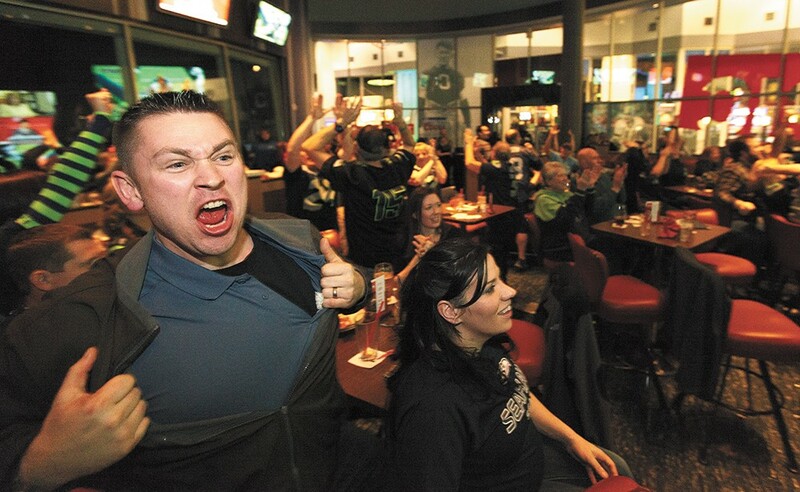 The 160-plus members of the Spokane Valley chapter pile into buses once a season for the trek to seismically loud CenturyLink Field. 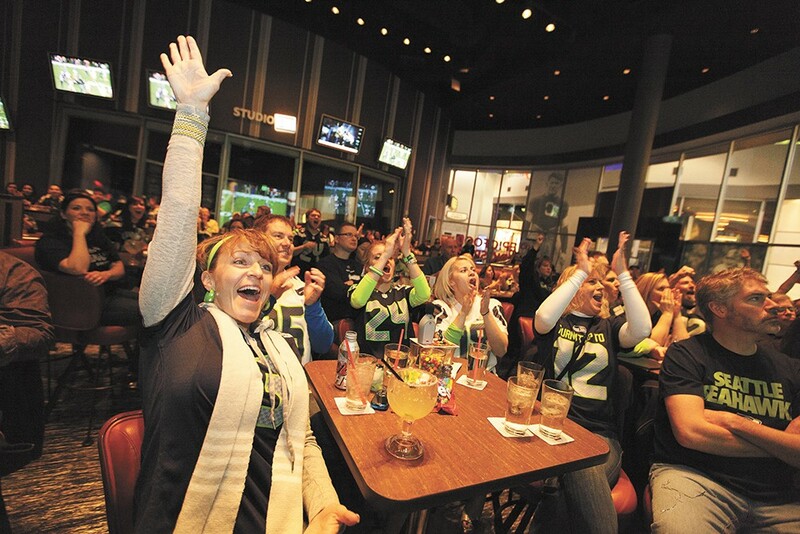 On other Sundays, including this coming one, you can find them at Goodtymes Bar & Grill, cheering on their Hawks. By 1986, the Seahawks had built a practice facility in the Seattle area and decided to move training camp there. The next 11 years saw the team dabble in mediocrity and sub-mediocrity. Interest in the Northwest, the Spokane area included, waned, and there were rumors that if the team couldn't land a new stadium, they might skip town. The Seahawks and new owner Paul Allen wanted statewide support for a stadium referendum in 1997, and shortly before the vote it was decided that the training camp would return to Eastern Washington University. McDonald has trading cards in his office signed by players during those camps. One time star receiver Joey Galloway picked his son out of the crowd and signed the back of his T-shirt. They'd hold camp in Cheney for another nine years before again returning to Seattle. "I wish [camp in Cheney] would have continued. I understand there's a cost to it, but it meant a lot to fans over here," says McDonald. By the time training camp moved to the west side, Inland Northwest Seahawk fans had seen their team steamroll competition in the mid-2000s and appear in a Super Bowl. Those who had suffered through the era of Rick Mirer — the second overall pick in 1993, punted away after four seasons — were rewarded and newcomers had a proven bandwagon on which to jump. Mickey and Jen Tuter are going to the Super Bowl. Just a few days after deciding that they'd rather celebrate Jen's 40th birthday and their 10th wedding anniversary at MetLife Stadium in New Jersey with their beloved Seahawks than on a cruise liner, they still don't have tickets, but Jen has her eye on the web and she's not worried. She's not hung up on that cruise, either. "You can go on a cruise any time. This is the Super Bowl," she says. The Tuters, season ticket holders for the past two seasons, are the sort of fans who took their family photo with a 12th Man flag in the background and held their Christmas party during a televised Seahawks game. It was Jen who brought the team into the family, says Mickey, a lifelong Spokanite. He was a casual fan, but Jen lived the Seahawks life during college. She nannied for longtime safety Eugene Robinson and lived with the family of kicker Todd Peterson while she was studying at Northwest University in Kirkland. The couple make it over to nearly every home game during the season, driving back to Spokane after the game. They listen to the postgame show on the radio, and when they finally get to their house, rewatch part of the game they've recorded on their DVR. "Yeah, you could say we're Hawk geeks," says Mickey. It's usually somewhere this side of Ellensburg when Todd Weaver starts to notice the Seahawk stickers and flags on cars heading westbound on Interstate 90. Weaver, 48, who owns a metal fabrication company, usually drives over the morning of a game. "It's interesting how many people you drive by that have jerseys on if you're heading that way," he says. For the NFC Championship game, Weaver ran into several friends from Spokane he had no idea would be there. They'd found last-second tickets, then wrangled a private pilot to fly them over in time for kickoff. It's different from the days he remembers seeing games in the Kingdome, when the fans, led by burly Bill the Beerman, made downtown Seattle rumble even when the Hawks were losing — which they did a lot. When Richard Sherman tipped that ball to Malcolm Smith, those years of fandom that began in the stands of Joe Albi Stadium almost four decades earlier were well worth it. Weaver's 15-year-old son, indoctrinated as an eastside Seahawk fan at birth, was right there with him.